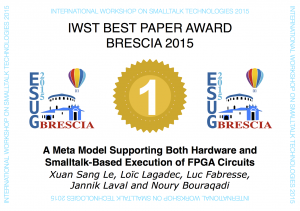 Our paper presented at the International Workshop on Smalltalk Technology 2015, Brescia Italy, as part of the PhD of LE Xuan Sang received the 1st prize, offered by the Lam Research Corporation. High level synthesis (HLS) refers to an automated process that creates a digital hardware from an algorithmic description of some computation. From the perspective of Smalltalk, this process consists in converting a code from the OO level to the register transfer level (RTL), that supports direct compilation to the hardware level. In this paper, we present first steps to achieve this process. We introduce a Smalltalk-based meta-model that allows to express descriptions (i.e. models) of digital circuits. These descriptions materialize as Smalltalk code. A such circuit description can be run on top of the Smalltalk VM, simulating the parallelism intrinsic to hardware. Alternatively, it can be compiled into a binary representation directly transferable to FPGA chips, which can run and exchange data with Smalltalk objects. 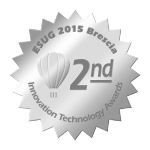 PharoJS won the second prize at the ESUG 2015 Innovation Technology Awards. For example, PharoJS can be used to develop client side web applications. It can also be used to support cross-platform mobile apps based on Phone Gap. PharoJS is freely available under MIT License. It can be dowloaded from SmalltalkHub. Due to their increasing complexity, nowadays intervention robots, that to say those dedicated for instance to exploration, security or defence applications, definitely raise huge scientific and commercial issues. Whatever the considered environment, terrestrial, aerial, marine or even spatial, this complexity mainly derives from the integration of multiple functionalities: advanced perception, planning, navigation, autonomous behaviours, in parallel with communication or robots coordination enable to tackle more and more difficult missions. But robots can only be equipped with such functions if an appropriate hardware and software structure is embedded: the software architectures will hence be the main concern of this conference. As quoted above, the control architecture is thus a necessary element for the integration of a multitude of works; it also permits to cope with technological advances that continually offer new devices for communication, localization, computing, etc. As a matter of fact, it should be modular, reusable, scalable and even readable (ability to analyze and understand it). Besides, such properties ease the sharing of competencies among the robotics community, but also with computer scientists and automatics specialists as the domain is inherently a multidisciplinary one. Numerous solutions have been proposed, based on the “classical” three layers architecture or on more “modern” approaches such as object or component oriented programming. Actually, almost every robot integrates its own architecture; the workshop will thus be a real opportunity to share reflections on these solutions but also on related needs, especially on middleware for robotics, which are of particular importance in multi-robot applications for instance. Hence, this conference on control architectures of robots aims at gathering a large number of robotics actors (researchers, manufacturers as well as state institutions) in order to highlight the multiple issues, key difficulties and potential sources of advances. - No limit on article length, usually articles for CAR are between 6 and 17 pages long !